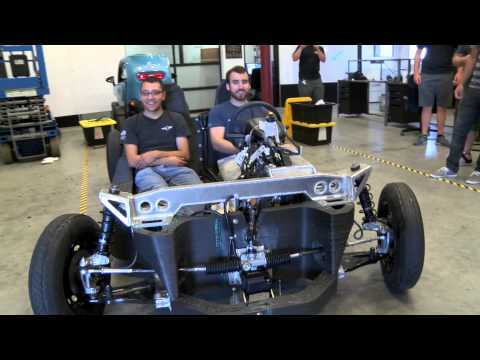 Local Motors, Inc., a Chandler, AZ company and the world’s leading open-source hardware innovation company, was part of the first-ever White House Maker Faire, June 18, 2014. In February 2014 the White House announced its intent to celebrate America’s students and entrepreneurs who are inventing the future. The event took place at the White House on Wednesday, June 18th. It featured “makers, innovators, and entrepreneurs of all ages who are using cutting-edge tools to bring their ideas to life.” The Maker Faire showcased, “Makers that are driving the next era of American innovation, as well as commitments by leading organizations to help more students and entrepreneurs get involved in making things.” Founded by US Marine and Iraq veteran Jay Rogers, Local Motors is helping to drive the Third Industrial Revolution by accelerating the pace at which ideas move from mind, to market. Local Motors presented its Mobifactory at the White House Maker Faire, which is essentially a highly customized shipping container. The Mobifactory design makes it easily transportable, which demonstrates both the making potential and scalability of Local Motors’ innovative method to manufacturing. The Local Motors Mobifactory will also feature a few MakerBot Replicator2 3D printers printing actual Local Motors production components for vehicles including the Rally Fighter™ and the Racer, as well as a scale version of the Company’s planned 3D-printed prototype vehicle. The planned 3D-printed prototype vehicle will be printed and assembled at the International Manufacturing Technology Show in Chicago from September 8-13. The winning design for the proposed vehicle was announced in early June and the prize went to Strati, a concept by Italian automotive designer Michele Anoè of Turin. A judging panel of industry aficionados chose Anoè’s design for its aesthetics, but perhaps more importantly, for the project’s compatibility with additive manufacturing technology like 3D printing. Local Motors is hosting a separate event tonight, Wednesday June 18 from 6-9 p.m. Dubbed, Local Motors Day of Making Open-Source Arduino Build Event, the event is being held to celebrate a #NationOfMakers in support of the first-ever White House Maker Faire. It is being held at the Local Motors headquarters in Chandler, Arizona and is open to the public.